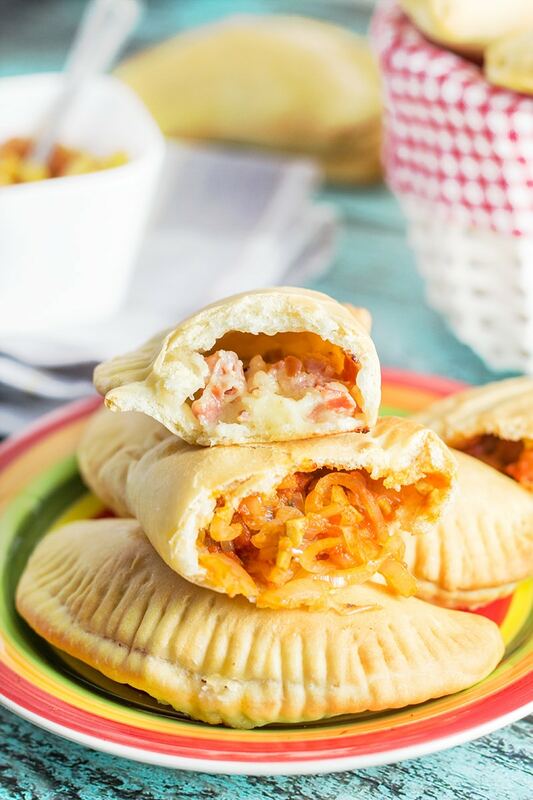 You can fill these savory Italian turnovers with anything you like! I made two versions: one with the onion and anchovy filling and the second one with the prosciutto and mozzarella filling. Both are heavenly! Pizza is like a second religion to Italians. They even have a law specifying what the real Neapolitan pizza is. It has to be round, no more than 14 inches (35cm) in diameter, and must contain tomato, basil and genuine mozzarella. This law even specifies how the dough should be made. These guys are serious about their food, no doubt about it. Pizza in Italy comes in many different shapes. 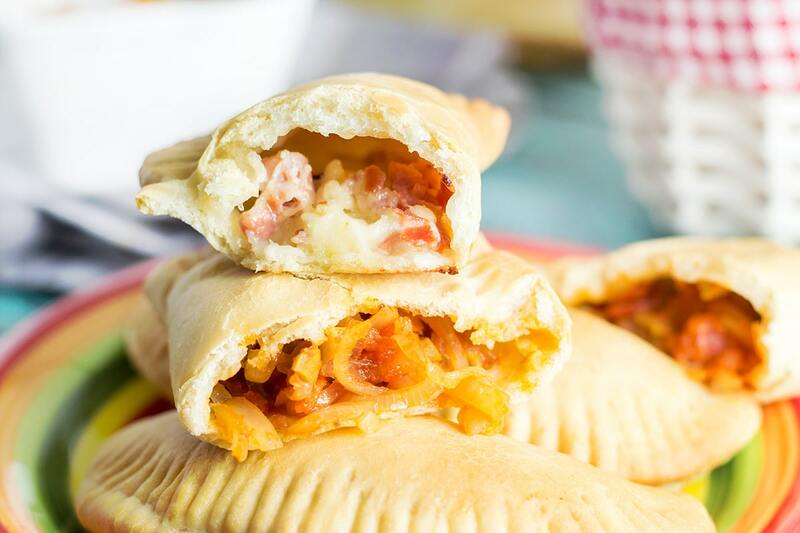 There is the one you are thinking about right now (the round), there is folded pizza (Calzone) and there is a smaller version of Calzone called Panzerotti. That’s the one this post is about! 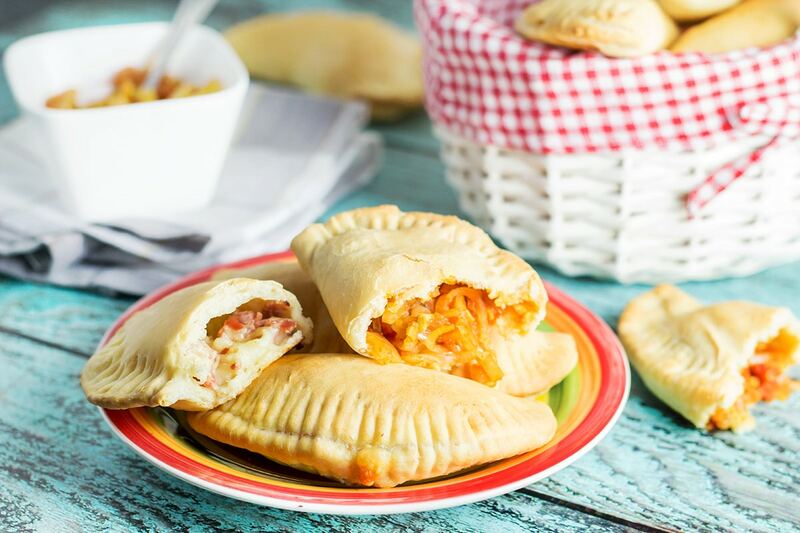 There actually are more differencies between Calzone and Panzerotti, not just the size. Traditionally, Panzerotti has to be deep-fried. Sorry guys, this time I stepped away from the authenticity. I baked it just because my wife is breast-feeding now and we don’t want too much oil in our food. 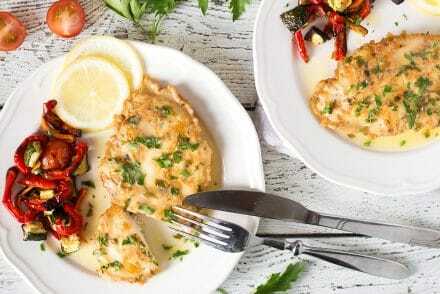 I really hope that Italians will forgive me (I’ve talked about their view on messing with their traditional recipes in this post). I PROMISE to make ummm let’s say next 3 Italian recipes on this blog following all the possible traditions. I made two different fillings for my Panzerotti. The first one is onions, canned tomatoes, olives, Parmesan cheese and anchovies. 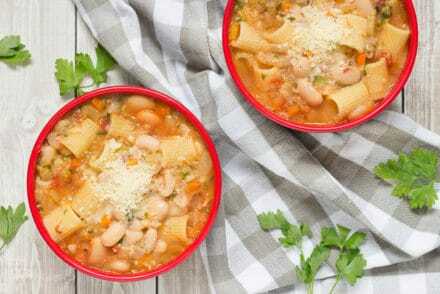 I adapted this filling from my beloved Mediterranean Cookbook. Don’t freak out if you are not a fan of anchovies. You won’t feel them at all, they are more like a seasoning here. The second filling is mozzarella, prosciutto and once again Parmesan cheese. For the amount of dough in this recipe you have to choose one of these fillings. If you want to make both, just double the dough. Simple! I am on a pizza spree lately. Just few days ago I made this beautiful French-German version of a pizza and now these little tasty guys. What can I say about Panzerotti? I freaking LOVED these Italian savory turnovers. I made both fillings and we have already gobbled up ALL OF THEM. Oh man, I don’t even know what number of serves to specify when two persons devoured everything in a day. We will run. A lot. And ride a bicycle. Maybe. This recipe includes two fillings, but for this amount of dough you have to choose one. If you want to make both, you have to double the dough or make less of each of the fillings. The dough. Mix water with olive oil. Set aside. In a bowl, mix together flour, yeast, sugar, and salt. Make a well in the center an pour in the water and olive oil mixture. Mix until you get the dough. Knead it on a floured surface until it is smooth and elastic (for about 6-7 minutes). Shape into a ball and place in a large greased bowl, coating the dough in oil. Cover with plastic wrap and let it rise for about an hour. Punch the dough down to release the air. The onion and anchovy filling. Heat the oil in a frying pan and cook the onions until soft but not browned. Add the rest of the ingredients, bring to a boil and reduce to a thick sauce. The prosciutto and mozzarella filling: Mix all the ingredients in a bowl. The assembly. Preheat the oven to 375°F (190°C). Divide the dough into 12 equal pieces. Roll out each piece into a 5-inch (13cm) round. 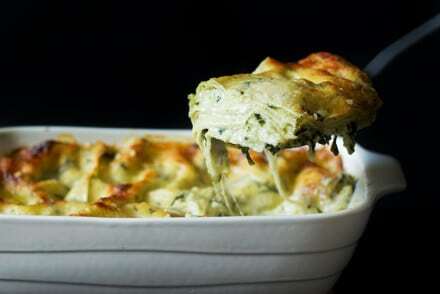 Place a tablespoon of the filling in the center of each round and fold over to enclose it. You can decorate the border with fork if you want to. Bake for 15 minutes, until puffed and brown. 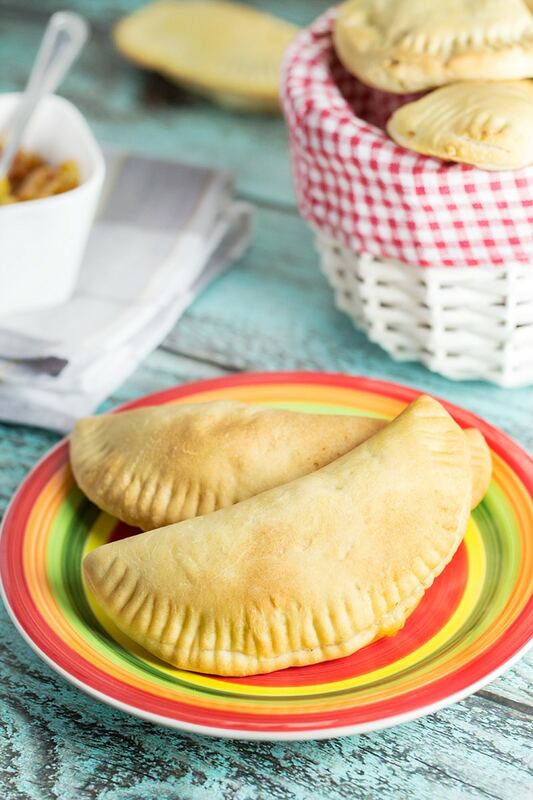 The authentic recipe requires Panzerotti to be deep-fried instead of baking. For frying heat enough oil to submerge them, wait until oil shimmers, and cook few at a time until golden and puffed.